→When Can Baby Sit In High Chair? 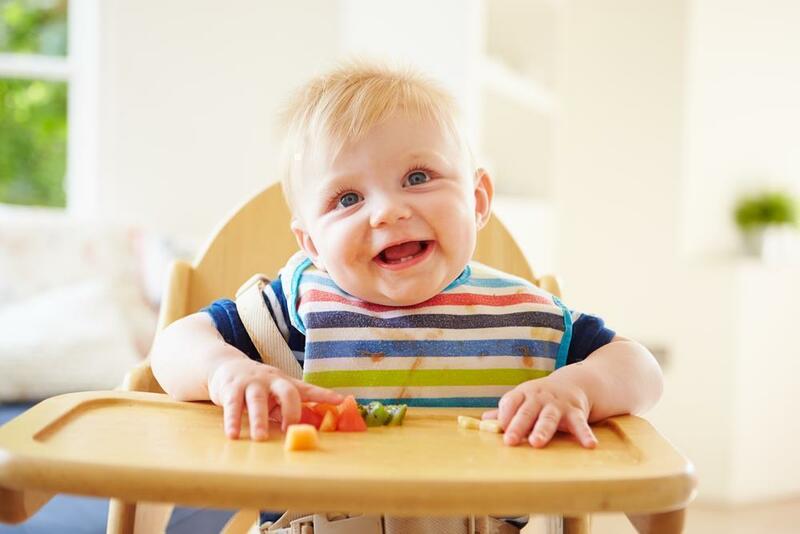 Aside from the very obvious perk of having your little one join you during meal time, there are also several advantages of using a high chair. Mind you; you shouldn't take this lightly. What you teach them at this point will reflect on their overall personality as a toddler and during their childhood. Social interaction: Whether you feed them with pureed vegetables and fruits or you train them using the BLW (baby led weaning) method, they get to interact with you and your spouse, their siblings or other family members. Right now, you should visit this article to choose the best ﻿highchair for baby led weaning. They will learn how to communicate their wants, and they will eventually understand the importance of listening. In my personal experience, eating together has become the perfect time to bond. And well, it increases my little boy’s appetite when he sees me and my husband heartily eating the same food. Character development: Don’t expect it to be mess-free, by the way. During the first few times we put him in the highchair, he practically threw everything in his tray. I ended up with baby carrots on my hair, and my husband had bits of steamed potato on his shirt. That’s part of their learning process. They’ll eventually learn how to eat cleanly (although it will take time), tidy up after themselves and more importantly, they will become less self-centered. It’s not going to be about ‘them’ all the time. Discipline: When you put them in a high chair, it will register with them that it’s meal time. You don’t have to chase them around while trying to feed them. You will all be the there around the dining table, and it will be less stressful for you. But the clean up part is no fun either! Nevertheless, it's also your chance to start teaching them some table manners if they’re big enough to understand. 1. ﻿﻿For folding highchair, always ma﻿﻿ke sure it’s locked before you tuck the baby in. And never place it too near the counter or dinner table because they might hold on to it and tip the chair. Or they might kick it with their legs. 2. Always use the safety harness and crotch strap. This is to ensure that are sitting snugly and also keeps them from wriggling around. Remember, babies especially toddlers are unpredictable. You’ll never know if they’ll scramble off the chair or turn sideways and reach out. It can result in falling or other more serious injuries. 3. Stay close at all times. No matter how stable or sturdy the high chair is, never underestimate a baby’s strength especially if they are adamant about doing something. Always be within arm’s reach. Pay attention to them and don’t leave them alone to go to another room. 4. Run your hands along the tray and also the leg room if there are any sharp edges. And as much as possible, regularly look at the crevices or if there are any loosened screws or bolts in the chair. 5. Check for any possible recalls. Readiness is the key. Although the baby can use it as early as four months or when they can already sit up straight without support, ideally, you should use it when they are starting their solids. Check the manufacturer’s recommendation. Just like toys and playthings, you’ll find this information when you shop for a high chair or high chair for travel if you have an idea travel with your family. There is no exact answer. Although it’s not ideal to start using it before four months old, keep in mind that some babies begin eating solid foods later than others. As mentioned earlier, it depends whether your little one is physically ready or not. Just like a child’s milestones or development, there is no particular month. Don’t pressure yourself if they’re already five months but still unable to use a high chair. Let them be, and when they meet the prerequisites of sitting up well and already starting solids, then you may now let them use the high chair. Keep in mind that you should look beyond the age. How's your experience with the high chair? Share with us in the comments!